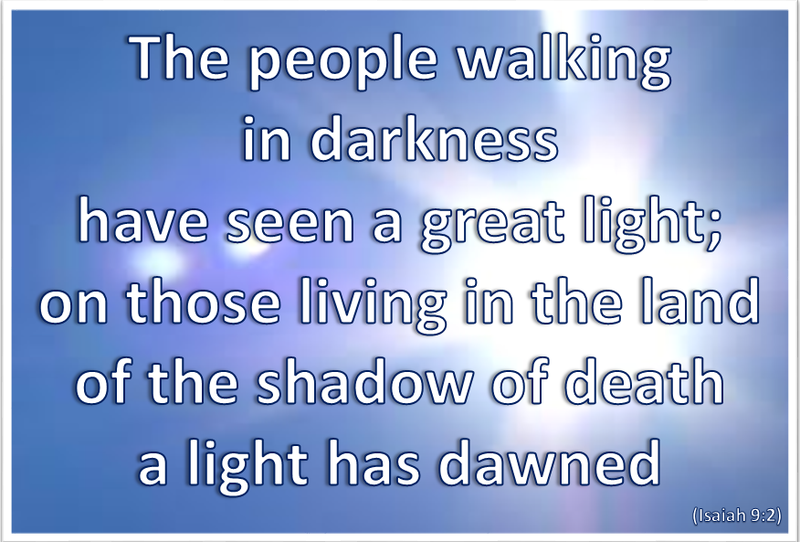 The advent of the Messiah was seen as the equivalent of a great light entering into a deathly darkness. The quality of the light is stressed by the use of the word great. It is not the flickering of a candle seen across the midnight fields but more the sudden rising of the sun after a moonless night. This same idea is picked up by John in the first verses of his gospel. The darkness of the world to which both the prophet and the apostle refer is the spiritual darkness that blankets and smothers life and hope, which destroys relationships and peace, turns love into a sadness and encourages all that is vile and destructive. In this darkness the only person we often can see is ourselves and this can become the focus of the individual, the community and the nation. For many life is a living death and death a fearsome obliteration. The coming of the Messiah as ‘the Light of the world’ couples together both light and life. The light which transforms our lives is the new light that is in Jesus Christ. It draws us to Him and although it may not immediately change our present situation it can transform us within our situation, which in itself will bring change. This light and life is associated with another word – love. They come from the God almighty who is described to us by John as love. The three belong together – love, light and life. It is this trinity that God wishes to impart into our lives and situations. Whoever and wherever we are today this is the gift that God wishes us to receive from Him. As we celebrate the birth of the One who is both Saviour and Lord, Life and Light, and the fullest expression of Love, we celebrate the greatest Gift known to humankind. Do I see darkness and/or light in my life? Whatever I have of the Lord I need more. Lord Jesus may Your Light within me grow ever stronger as I walk in trust and obedience with You – and may I become more of Your light in the world around me. Amen.